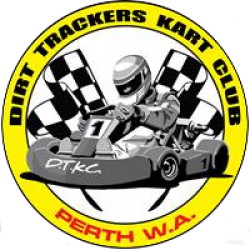 Dirt Trackers Kart Club – Get Dirty! Dear DTKC Members, Even though the WA State Titles, and National Titles have been run and won, there is still plenty of racing to be done!! The next DTKC Club Day is *Sunday 14th October 2018*, and *NOMINATIONS ARE NOW OPEN. * Drivers don’t forget nominations close *8pm Wednesday 10th October 2018*. No late nominations will be accepted so get online now and nominate. The club day features the Trophy Day for the *100cc Opens, KT Twins, 200cc Open & Outlaws*. Remember you need a minimum of 5 nominations to constitute a class. Please be aware classes may be combined (where allowable under the Rule Book) where insufficient nominations are received. *KT Heavy* drivers you are on a bye this club day and *Statesman’s* drivers you are on duty. Statesman drivers you will receive a separate email shortly. Or if you are not racing and wish to help in any capacity please email secretary@dtkc.com.au. *Timetable * Pit Gates Open: 7am Pit Gates Close: 7.30am to trailers Scrutineering: 7.15am – 8.15am Sign In: 7.15am – 8.15am Officials Brief: 8.15am *DTKC Special General Meeting – 8.45am * Drivers Brief: Immediately after Special General Meeting Racing starts 10 minutes after the completion of Drivers Brief Transponders are now in use at DTKC, please put TBA in your nomination if you have purchased one and not yet received it. They will be available for you to collect on the morning of Race Day. If you need to hire one for the day at the cost of $25 please type LOAN. When entering Boomerang Road please keep your speed to 30 k/ph MAX and respect the neighbours. If you have any queries regarding the above please do not hesitate to contact our Nominations Secretary Jade Walton on 0449 201 994 or myself on 0407 714 448. EDUCATION DAY INFO Sunday 9th September 2018 Pit Gates Open: 6.30am Pit Gates Close: 7.30am to trailers Scrutineering: 6.45am – 8.15am sharp Sign In: 7.00am- 8.15am sharp Drivers Brief: 8.45am On Track: Approx 9am 🌟Driver sign in on the Out Grid once your kart has been scrutineered please 🌟 🌟 Crew sign in at the Canteen area as usual 🌟 It is appreciated if the above times are adhered to so that we can get underway right on time and get you as many runs as possible. No unlicensed at this Education Day. Please consider the fellow karter when parking your car and trailer. When entering Boomerang Road please keep your speed to 30 k/ph MAX and respect the neighbours. Hi Members, Nominations for this Sunday’s race meeting close Wednesday 15th August @ 8pm. Late nominations are not accepted so please do not leave it until the last minute. See you on Sunday! 📚 JUNIOR EDUCATION DAY INFO 📚 Sign and Scrutineering 8.30 – 9.30am Kart Setup & Maintenance chat hosted by Robbo 9.45 – 10.45am Know your Rulebook hosted by Kylie 10.45 – 11.15am Drivers Brief 11.30am On Track 11.45am Finish approx 3.30 – 4.00pm Nominate via the Website for Licensed Drivers – noms close Wednesday 1st August @ 8pm. Unlicensed via the google link sent earlier this month. Do you have a child that has moved up to Seniors recently and would be comfortable to speak with the Juniors on the day in relation to what it is like racing with a whole new group of people? Let me know if you do 🙂 secretary@dtkc.com.au Thanks! ⬇️INFORMATION FOR CLUB DAY # 3⬇️ Nominations close Wednesday 16th May @ 8pm. Late nominations are not accepted so please don’t leave nominating until the last minute. Pit Gates Open: 7am Pit Gates Close: 7.30am to trailers Scrutineering: 7.15am – 8.15am Sign In: 7.15am – 8.15am Officials Brief: 8.30am Drivers Brief: 8.50am Racing from 9am Transponders are now in use at DTKC, please put TBA in your nomination if you have purchased one and not yet received it. They will be available for you to collect on the morning of Race Day. If you need to hire one for the day at the cost of $25 please type LOAN. When entering Boomerang Road please keep your speed to 30 k/ph MAX and respect the neighbours. If you are not racing and wish to help in any capacity please email secretary@dtkc.com.au Thank you.